Behind rows of worn out desks, a feeble table, old tins and a group of 30 youngsters aged between seven and seventeen, is the survival story of a group trying to reverse the devastating effects of a toxic fungus that claimed their parents’ lives. The Eastern area of Kenya is one of the driest in the country, receiving little or no rain which has seen locals predominantly rely on relief food. But a prolonged rainy season in 2004 saw farmers return to farms with promising results. Barren lands were transformed to lush vegetation. Majority of the smallholder farmers had invested in growing cereals like maize, which is Kenya’s staple food. However the burning desire to harvest their first produce after years of waiting saw the farmers harvest the maize prematurely. From farm the maize went straight to consumption stored for future consumption. Unknown to most of the farmers, that would be the last they would consume. Over 80 farmers from the larger Eastern area died in 2004 after consuming the maize which was said to be contaminated by the aflatoxins. Thousands others were hospitalized for months. Fungi Aspergillus is the toxic fungus that causes aflatoxin poisoning especially because it infests grains like maize when they are prematurely harvested or stored in poor conditions. The following year dozens more died with the Ministry of Health declaring the aflatoxin menace a crisis. The government offered to buy all the contaminated maize from the farmers to contain the spread. But even as government moved to arrest the situation, families were left without mothers, fathers and children. Charity Mwikali was only five when she lost both her parents to the poisoning. “I was very young the only thing I can recall was being taken to the farm and placed under a shade as mother and father worked on the farm. It must have been a great year for them because they were actively involved in planting and harvesting. Few days later I only remember many people in our home singing and crying. My parents had passed on. I have been raised in a children’s home since then,” recalls a remorseful Charity. Charity is among over 30 children who were either left with no parent or lost one parent. Most of them have been adopted by well wishers or guardians. Every now and then when it rains in the area, the same practices that took the lives of their parents are practised by majority of the farmers in the area. Charity now 15 years and having learnt what took her parents’ lives has vowed to fight the fungi with the only weapon she knows best; information. In association with a youth group in the area, and having been trained on simple ways to contain aflatoxin by a missionary group, they have come up with a class that takes place every evening of Monday and Wednesday and the entire day on Saturdays. “We target young ones because they are mostly involved in the farms. It is also easier to get them to influence their caretakers to adopt easier ways of planting and harvesting. The progress so far has been remarkable,” said Mworia Mutiso a friend of Charity who is also an orphan and actively involved in training. At harvest the moisture content in grains should not exceed 13.5 percent, but most farmers unknowingly harvest early when the content is over the 13.5 percent mark or end up storing maize in damp environments. That causes the mycotoxins fungi to grow on the grains. Some of these mycotoxins have toxic varieties that kick-start the growth of fungus that generates the aflatoxins. The school therefore teaches the kids simple techniques that tests if the maize has the right moisture content during harvesting. 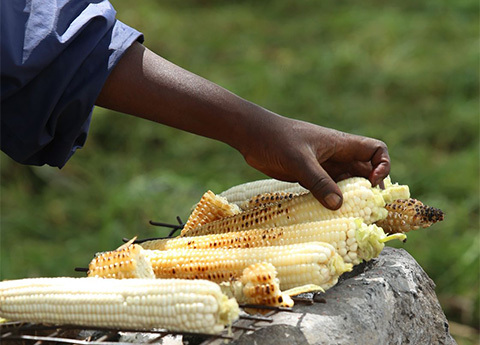 Such techniques include shaking maize in a tin and listening to hear if a crackling sound is produced or placing a grain on ones teeth to test its resilience. If the tooth easily grinds the grain the maize is not ready to harvest. Other techniques include drying maize in raised racks, the size of a trampoline, which are then left open to ensure maximum drying. “As the next generation of mothers, fathers and farmers, we have vowed never again should anyone in our area die due to lack of information on controlling aflatoxin. The painful memories will serve as zeal to spread the word around,” said Angelo Mueni one of the students.